If you have a large e-mail box, and/or you want to keep your emails as clutter-free as possible, Outlook 2016 has a great tool to help. 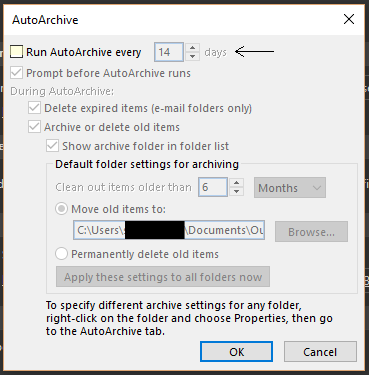 To Auto-Archive ALL of your emails in Outlook, follow these steps. First, open up your Outlook 2016. Make sure the email account you want to Auto-Archive is added. 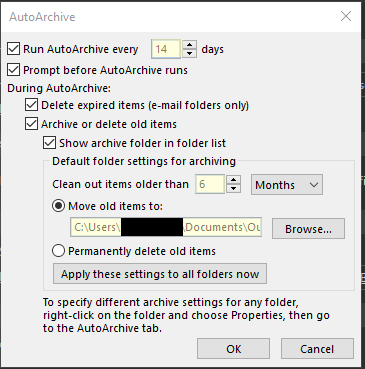 Check the box next to “Run AutoArchive every”. Adjust the Values for how frequent you want the task to auto run, how far back you want to archive. Make sure you make note of where the file for your Archive is being stored. This file will be important to backup. Please feel free to contact support if you have any questions regarding Auto Archiving.